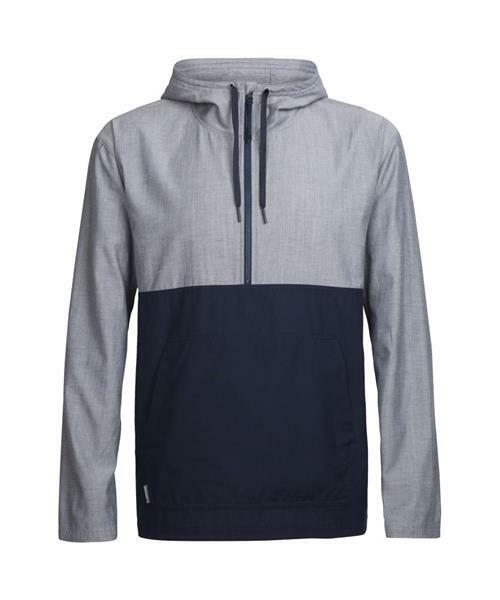 * Center back length: 78.3cm/30¾"
Escape Hooded Pullover - Mens is rated 4.3 out of 5 by 4. Rated 4 out of 5 by Winters from BF loves it Purchased this for my bf as a going away gift for his semester studying abroad. He had been looking for an anorak for a long time and instantly loved this one when we saw it at the mall. It’s lightweight, soft and the two tone colour is well done (got him the navy blue one). The material and zippers are sturdy despite th fabric being thin. The side zip is convenient for putting on/taking off. It’s long enough that when he raises his arms, his stomach isnt exposed but not too long that it looks like a dress. A great value at the sale price but not sure if we’d feel the same way if I’d paid full price but overall hes very happy with it. Rated 4 out of 5 by Rosaire from Great all around hoody It's quite lightweight, so good for summer time, or to wear indoor on winter. It looks quite resistant, but it isn't stretchable at all. While it makes it interesting in a way,, since the finish looks quite nice, so it strikes an interesting balance for different contexts (I can use it while camping, as well as for Law school). While the fit is quite large, sleeves are a bit short, so if you're a climber, with larger shoulders, it might feel loose in general, but is tight as soon as you stretch your arms, and since the fiber is static, it doesn't help much for that. I quite enjoy the overall conception in general, zippers seem sturdy, it's nice to have one on the side, makes it easy to put on and off, and adds some vent! Bottom line, it think it's already becoming a favorite in my wardrobe! Rated 4 out of 5 by james8765rt from A little bit of colour! I appreciate that this hoody has some colour. Men's clothing needs more pizazz! Also I appreciate that it is made only of woll and cotton. No synthetic fibers is harder to find. Please make more clothing with petroleum/plastic based fibers! Usually I wear size large for Icebreakers garments, this hoody is a bit larger than I expected, but still comfortable. Rated 5 out of 5 by CSCIronman from Great Hooded Pullover Great addition to laid-back outdoors or casual day hike, combining the natural moisture-wicking comfort and anti-odor properties of merino wool. Has a comfortable natural feel that is roomy and relaxed. Comes with a loose-fitting hood that adjusts with drawcord and a chest-to-neck zipper and a kangaroo pocket that keeps hands warm.